As you can image from my blog’s title (Broken Paintbrush), I’m rather hard on brushes. Even when using Brush Soap, my detail brushes seem to split almost as soon as I start the second model. This is why I’m excited to review the Warcolours Paintbrushes here. Disclaimer: Warcolours sent me a free set of paints and brushes to review for the Golden D6. The links below do include affiliate links, meaning that if you buy these great brushes, I get a small bonus to help fund this blog. Even though I got these for free, I still only recommend Cool Tools that I actually use and would want you to use too. I first heard about Warcolours when Adam from the Golden D6 asked if I wanted to review their line. Try out free paints? Of course, I said yes! So Neo from Warcolours was awesome enough to send me a set of not only their paints but brushes and a pot of powder pigment as well. I wrote up a full review of the set for the magazine (grab a copy of issue #5 here) and used everything I could to paint my first INQ28 model. And while I touched on my review of the brushes, I wanted to expand on them here. As a company, Warcolours is located in Cyprus and hand makes all their paints. While the only place I found to buy their paints outside of their site is Amazon, they have very affordable shipping which makes it pretty easy to get worldwide. Currently, WarColour paintbrushes come in 5 sizes: 000, 00, 0, 1, and 2 which would be similar to Games Workshop Artificer, Small and Medium Layer, and Medium Base. They currently don’t offer dry brushes or anything larger than the #2. 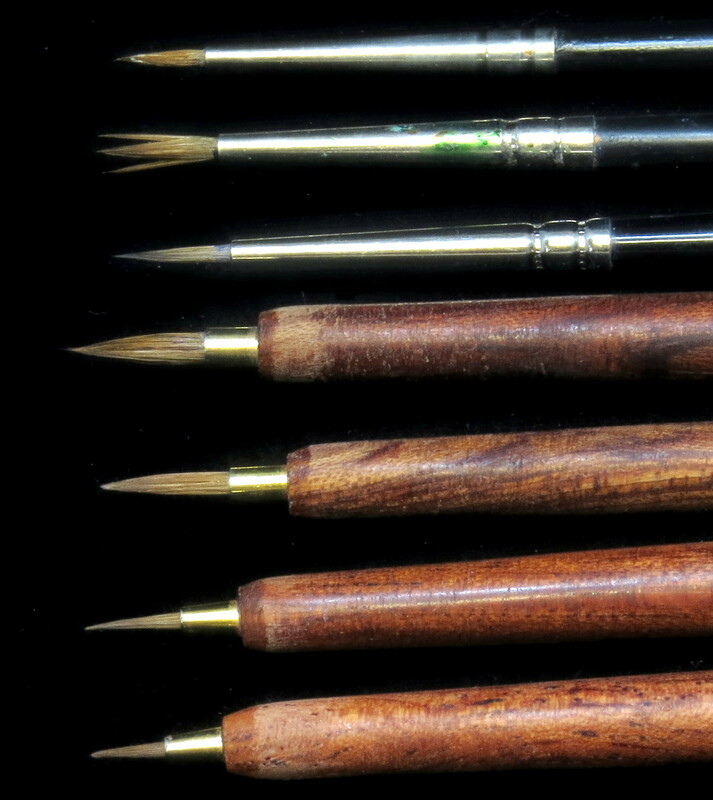 They are made with red sable hair and wooden handles which put them on par with the Artificer series and Winsor & Newton Series 7 brushes. While not everybody likes the natural hair for bristles, they provide a great combination of keeping a fine tip while being able to hold a good deal of paint. It’s this fine tip that I have enjoyed about the Warcolours paintbrushes. Since receiving them, I’ve not only painted the Techno-Barbarian but about half of the Mansions of Madness set. Oh, and nearly all of it was done with the #2 brush! I used the #1 on a few small highlights and the #00 for the eyes. Yet with all that abuse, the brush still has a sharp point and hasn’t once split while painting. (The picture of the tips above is was after all this abuse). I’ve never been able to do this much on a Games Workshop brush, and while I like my W&N, I only have a #1 and only used it for detailing. For me, the biggest difference between the WarColours paintbrushes and GW or W&N is the handle and the way it feels to hold it. I know this seems like an odd thing to compare considering it’s the bristles that do the work. But a big part of what separates beginner painters and award-winning artists is brush control. Meaning, if you can learn to place your brush where you need it to go, it can make a huge difference in your painting ability. Much of this is learned through practice, but I think the WarColour brushes design also helps. When you compare it to the GW and W&N brushes, the brush end is slightly wider, just enough to make it easier for my larger hands to hold without tiring as much. The ferrule (the metal part that holds the bristles in place) is also much shorter, which allows you to get nearer the model as you paint. So I got you all excited about these cool brushes right? But you are used to W&N or Rosemary brush prices where a new brush costs more than a new model? Well, as I mentioned in the intro, one of WarColours distinctions is their economical pricing. I’m not sure how their business model works that they can do this, but the five pack of their brushes cost less than a GW Artificer brush at 16.95€ or $18.63 at the time of this post. If I got you interested in picking up a set of WarColours paintbrushes and you want to support Broken Paintbrush, use one of the affiliate links below. You pay the same price as going to the site direct, but I get a small kickback. This helps pay for hosting and incentivise me to do more tutorials (the coffee and beer money are good for that!). If you have a set of WarColours paintbrushes and want to leave your feedback, put it in the comments below. I’ve had a great experience with them, but I would love to have my readers be informed with other’s opinions as well.